Okay, if I hadn’t just given it away in the headline, would you know what this flower is? Along with okra, salsify (Tragopogon porrifolius) goes under the category of Prettier Flowers Than You Thought Vegetables Had. This particular one also fits into the Biennials Pretending To Be Annuals group – it was not actually supposed to bloom until next spring. Well, it has been a strange year. What is salsify, you ask? It’s a member of the family Asteraceae, native to Europe but growing wild along with its “goatsbeard” cousins all over North America. It used to be a common resident of the vegetable garden – often called “oyster plant” for the faint resemblance in flavor – but is not often grown these days. So of course I thought I’d try! 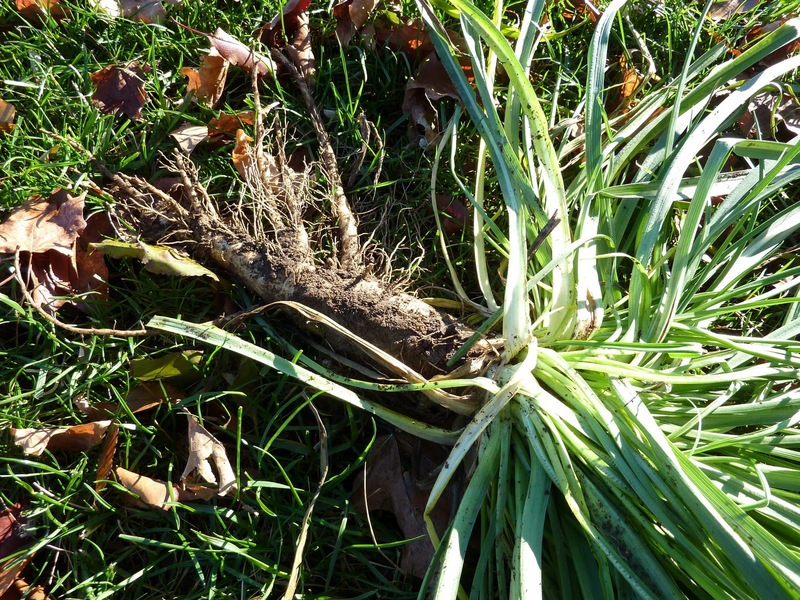 Both salsify and its relative scorzonera (Scorzonera hispanica, sometimes called black or Spanish salsify) are easy to grow, though they do require a deep loose soil and a long season to grow in (seed sown early in spring; harvest in fall into winter). I dug some of the plants at the demo garden today, and left some to wait for an early spring harvest (or perhaps bloom). 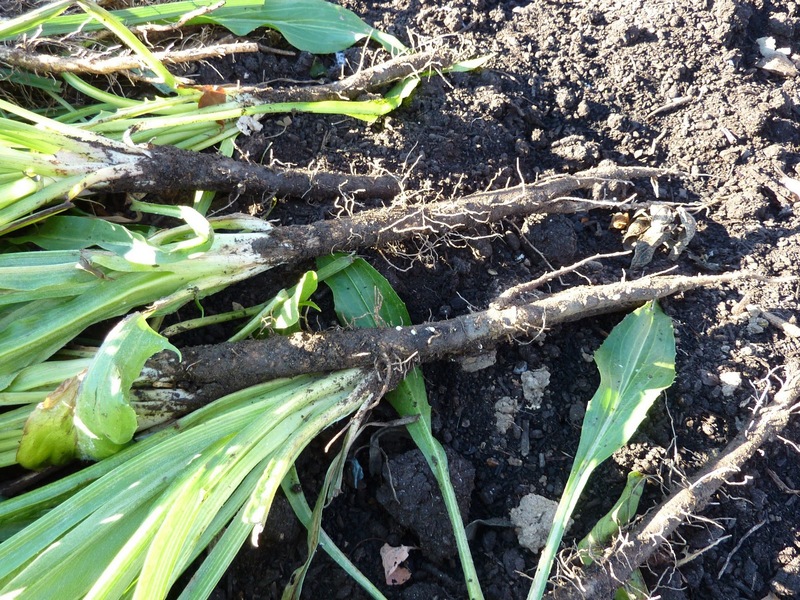 There are lots of recipes around for salsify if you search online (and you can use scorzonera in any of them as well). Since I still have Jerusalem artichokes to use up, I made this recipe for Braised Salsify and Jerusalem Artichokes from the Washington Post. It was very tasty! 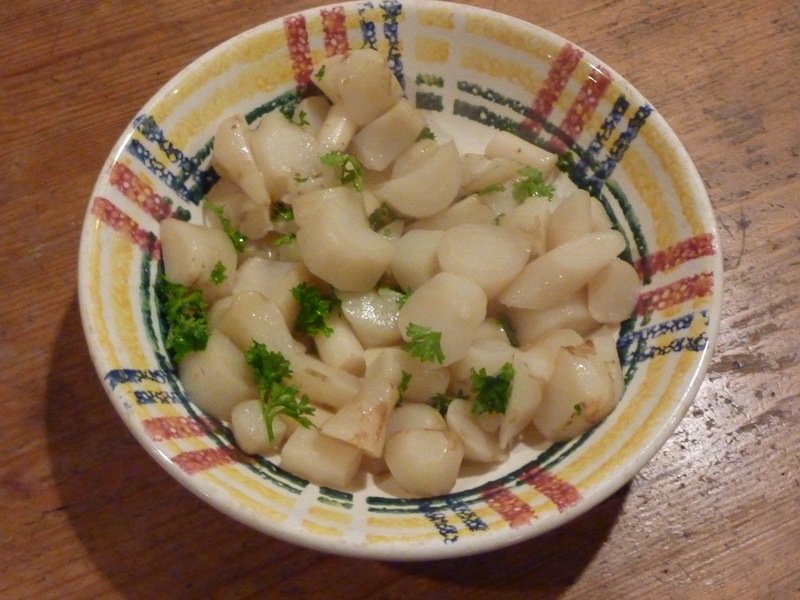 It’s a good idea to put both the salsify and the sunchokes into water with some lemon juice added as you cut them. This keeps them from discoloring. 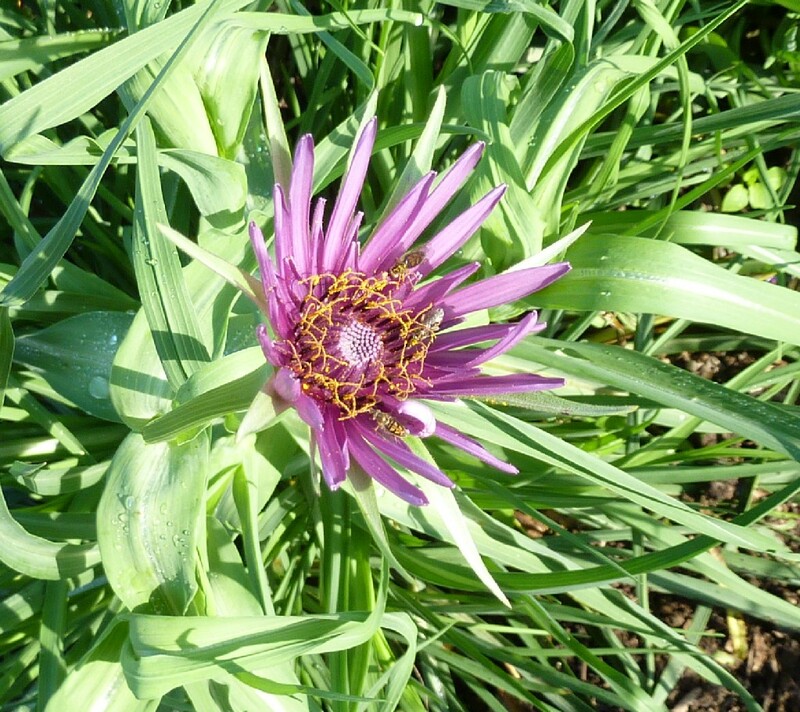 You may be able to find salsify or scorzonera now at farmer’s markets or adventurous grocery stores, so look around! You are an intrepid gardener and cook (not to mention a good writer! )I never seen these vegetables for sale anywhere, although I did get the sunchokes as part of a CSA share one year. Then CSA members complained that they were getting vegetables that were too weird. So, I have to ask…did it taste like oysters? I could have made some guesses as to what other plants the flower looks like. Such as ice plant, aster, and some bromeliads. But I can honestly say I would never have guessed salsify! I have yet to try it, but I have seen salsify on restaurant menus. RobinH's story about the complainers is so sad!! Ria, it tastes a little like oysters, but I think it's a stretch of the imagination. Robin and Wendy, I agree that people should try more new things. It's easier all the time to find ways to prepare them – we used to have to find cookbooks and now you can just search the internet. What a lovely flower. I certainly never would have guessed what it was. I've heard of salsify but never tried it.